are ghost proxies available to supreme site? The one is blazingseollc, Another is the ghost proxies! And about ghostproxies，after payment, you have to waiting for so long time to get the proxies, Last time I wait for 2 days…still not get their proxies, then I refund from paypal, No support give me a reply…look like their proxies rent from other proxy provider! Some guys on twitter say they are resell the proxies from buyproxies.org, But I am can not 100% convinced that, BUT you have to waiting for so long time for their proxies is 100% convinced. For copping on the supreme, you have to use the dedicated proxies, which give you the fast connections to use, stay away from the shared which spam or abused by other users. Hello John, I missed the supreme drop for the 3rd week in a row. I tested the bot out at home about 20 times and that probably banned my ip there, but I’ve been actually trying to get the drops at school which is about 20 min away from my house. Idk but it think the ip there is different. Should I just buy proxies open a few google chrome windows, sign into different google accounts in each window and add different ips to all of the bot windows on the software for the bot. 2) Easily set up the proxies on your browser (or copy the proxies on your Bot if you buy a Bot). 3) Yes, recommend. Supreme now easily block a specified IP address which sent lots of requests for copping in short time, with the proxies you can run more accounts and tasks to run. So, It seems like it could be more practical to use some sort of chrome extension that would allow you to use a different dedicated proxy for each window on chrome and just open as many windows as you have proxies, assuming you are using 20 proxies, In this way, Supreme sees you as 20 individuals (for 20 different IPs), So, The chance of IP ban is reduced and you run 10-20 accounts which more chance to win. Last, At now Captcha is a bottleneck on supreme and it’s causing issues for most people, The most successful guys may be combination of autofill extensions and the others are using private scripts that acquire a boat load of captchas. i want to know by the mmp group could buy supreme’s clothing or just buy some supreme’s sneakers? The proxies just a tool which help you to bypass the IP ban or prevent IP restriction on supreme. So, if proxies works on supreme, should works on well on all stuff. And you can use the proxies for running multi-tasks to increase the chance to win. Does the AIO BOT works for ASSC(shop.antisocialsocialclub.com) and palaceskateboards? 1. IP address on the internet. if you want to cop on US supreme, you need to use US ip address. 2. Billing address. You also need the billing address that allow to use on the supreme. 3. Shipping address. Cop on US supreme, NO doubt you need a US shipping address. I recently bought a proxy by YourPrivateProxy. I tested out this proxy on the supreme site. Now my proxy isn’t working anymore. Is this because of my tests? To many times? I just want to buy stuff on the supreme site for myself… so 1 proxy will do I guess? Is that correct? Any updates about the best bots? There are many reasons that proxies are banned by supreme, The one is just you use the proxy to test via your Bot…when you test(means ping to the supreme via supreme BOT), the supreme may suspect and ban this IP address! I don not have much experience on it. Allright. Thanks for your reply! Nowadays the VPN almost cannot works for all the VPN service which offer the shared IP address, all of their users can access the IP address. The answer of your first question is YES, when you use the US IP address the online store will be auto redirect to the US supreme store, which is easy to know. The “yourprivateproxy” only offer the ordinary private proxies which not tested for any special website before you buy, but offer 3 days money back, MPP offer the sneaker proxies which tested before you buy but no money back offered, so you should make a decision by yourself . So I need VPN + Proxy in order to enter US online store and cop supreme successfully? How can I test the proxies by myself before weekly drop? Just use the proxy will be fine…VPN is also another type of proxy in my view. I reason to use Proxies is, To get more IP address for preventing IP restriction by US supreme online store. Yes, you can test proxies, easily test the proxies on your browser, but i don’t suggest test the proxies on your BOT..which may let the proxies banned. Obviously the VPN is banned by supreme….You should almost all VPN are shared to use by their users!!! That means the VPN service only offer shared IP address to use, so all the IPs are already banned or marked by supreme. So you have to use the private proxies to use for copping, and you can also use residential proxies to cop, which ip address more like human but may slow, and hard to find. And In nowadays, the dedicated proxies are still the best solution for that, but you have to find the right proxy service. do you have any recomend proxy service for me? I already added 5 best proxy service on this post, I would recomend you use MyPrivateProxy, which you need to buy their “Sneakers proxies” on dedicated proxies package for the Supreme. But, residential proxies are more expensive and slow. Last, you have to decide by yourself. Yes, it should works, and you need to find the address to receive the stuff from other countries, Specifically lots of guys buy from UK. Hey John this Article is extremly helpful and I want to thank you firstly. I have manged my way arround Bot and Proxies very well already but I ám starting to get some errors in the latest drops. 1. My Bots get Cart Redirect Errors constantly what can be the reason for this? 2. If I buy a proxie for UK can i stil ship to my homecountry even to the proxie is UK based? 1. I really don’t know which bots you are using, I suggest you contact to support of bot. And, that may be you are run too many tasks/accounts at one time with same account information. 2. Of course, but you have get UK payment methods and UK address to ship, some of online re-ship service, it’s really not so difficult. 1) the heatedsneaks bot support guy was adamant that the proxy be nearest MY LOCATION …. not the stores. ??? I havent purchased proxy yet. Til i figure which location. 2) does each bot use its own keywords for an item. I would have thought they would be the same from bot to bot. But someone told me each bot uses different keywords for a given item. Which is true. It I’m going for SUPREME product. I’ve heard a couple different answers to this question. What City should I select for the Proxy. The City that’s nearest me … or the City that’s nearest the retailer’s …. website ? or Shipping Center ? my Proxy package offers one city. The cities below are just a few of the many they offer. Do you have a recommendation. Supreme CND locations in Ashburn,Virginia, Newark and New Jersey, you need you find the Location of proxies that’s closer the CND location, That’s will be reduce your PING. And you can search their domain whois to get the information about their server locations. 1) do you find some bots are simply better and get more deals than other bots… all other factors being the same. 2). if you get Supreme friendly proxies , can those proxies be used on other store sites, like for Yeezys and Nikes etc. 3). or so you need distinct store specific proxies across the board. 1. i only use bot from anothernikebot..I am no experience on other bots, Any good supreme bot, let’s know. Nike > Supreme NYC (Use CND – content delivery network ) > Adidas US > Adidas UK > Footsites, such as Footlocker, Footaction, EastBay, ChampSports, Finishline, SneakersNStuff. So if you have the proxies, why not use the proxies on others? 3. If you can find good re-ship service and payment methods, it’s really a good choice for that, Such as, Adidas UK is really easy to get than Adidas US, and now US proxies are blocked too much than other countries proxies. Does > Adidas US > Adidas UK > Footsites, such as Footlocker, Footaction, EastBay, ChampSports, Finishline, SneakersNStuff. also use the CND, or do they use something different. I was unclear. At this point I have not got any proxies yet. Just so I’m clear. I WOULD NOT use one Store specific proxy on another Store. (I could but my chances for success would not be as good). I don’t want to buy separate proxies if they are interchangeable between stores. What exactly does proxies guarantee if successful? Like does proxies allow more tasks per ip address? I’m asking this because if I have lets say two credit cards going to two separate addresses, I could get up to 2 pairs per website. However how would that change with a proxy? And look like you want to know why use proxies? You may already know the supreme or other sites don’t allow to cop the same item with same address or same credit cards. if so, your orders usually will be get cancelled and remain only 1 orders, sometimes losing all orders with bad lucky. Now the Nike, supreme and adidas are all don’t like the guys who are using the bot or tools to cop, To prevent it, sneakers websites really hate it, so run banning technique on IP address. The system can easily block a IP address which sent lots of requests on add to cart in short time. And now both Nike and supreme are running the IP blocking technique, they can easily detect the abnormal activities via your IP. 1. The proxies can help you run multi task on sneaker bots or other tools. 2. The Proxies help you to Bypass the IP address banning technique on foot sites. So, if you’re want to get more stuff, It’s wise to use the proxies to win the game. Hope you get it and Any more questions, just let me know. hello， I bought some proxies from the website, however, when I use the proxy tester, it said that my proxies were unable to connect to the supreme website, do you have any solutions to fix this problem? Thank you very much!! There are many reasons that’s proxies can’ works, I suggest test the proxies on the browser, not just test proxies for Supreme also for other websites such google, FB and so on, if its only not works on supreme that’s means the ip address was blacked by Supreme. And the proxy can not works on other common sites that’s mean the proxy not get correctly or problem comes when proxy authenticate, The problem have happen i just need to contact proxy providers use their ticket support, such as MPP suport. I was just looking at yourprivateproxy and proxy-n-vpn. Which one is better for Supreme? To avoid supreme’s duplicate check do I need to change my address, name, and card? Also, when purchasing a proxy, it gives me multiple options getting more expensive with plans including more proxies. Even though it has more proxies, is it all under one address or does this just mean you are buying more addresses. Like (192.168.0.1). If it is all under one proxy, how many would you need to buy around 3 of one supreme item. I know this is a lot of questions! 1. I suggest you use yourprivateproxy for supreme, Proxy-n-vpn only offer the proxies from full prefix in same subnet for the footsites or Supreme. 2. Yes, you need multi address, multi credit card info. If use same information on two or more orders that usually will be get cancelled and remain only 1 orders by supreme. 4. You may need 3, But it’s really hard to estimate how many tasks you need to run, there are many factor on it. But you can do more more tasks means more chance. So just changing the address isn’t enough? If this is true, can i change the card and address but still have it under the same name? Also, my bot doesn’t have the option to put multiple proxies in, just one. So is there any need for a proxy unless supreme bans my ip? Can I use the same email address? And is it ok if for a card I use, the owner’s address is not the address it is being shipped to? And Can I use same phone number or should I change that too? The supreme have a automated system that detect whether the orders by one person or not,if so, your other orders can be get cancelled and remain only 1 orders. I think there are many parameters, such as IP address, email, address information, billing information…to pick up on that, It’s really easy to find your orders, If you’re use two same address or same cc(credit card) information. And You should brain storming on how to get more address and billing information. There are many bank and company offer virtual credit card online, Ok, i want to tell you more, you may check the privacy and entropay to solve the issue on CC. What’s i should tell you…oh.. I think you should works harder on your study. Does entropay virtual cc accepted by supremenewyork? So, you should check entropay virtual cc which show your Billing address or not, if not, i think which should works, but you have to try one by yourself. If we’re buying only 1 of each item is there any reason for purchasing a proxy? Use server mean get more faster speed. Use proxies mean you can get more chance to cop more stuff, It’s just like a game, you may win to other or also you may fail, you just can control the probability of win rates. For some of special guys in this market. they’re usually get more size of each item, if get the size that not need, they can easily change to other or sold out. I just bought a bot for Supreme called Superbot Pro. On their website, it says that multiple users can use it at the same time, but on the same IP address. Does this mean that you can’t use proxies? If THE Bot can works for multiple users with one IP address, you really don’t need the proxies. But, I am no experience about how it works with same IP address. And i hope you can share your experience to others after you used this bot. Hi, on “yourprivateproxy” there is 2 format types for dedicated proxy: Http/https and Sock5, so what is the difference between those two ? Also they ask to select the proxy authentication, that i don’t really understand too could you explain ? Http/https proxy can only use via HTTP request mean only can use on browser or other tools that’s support http. Sock5 proxy can use on more client or app, such as Skype, FTP, MSN, Outlook and so on. Which one should you use depend on what’s application you want to use. So if i want to use proxy for supreme it’s better to choose http/https proxy ? It’s on the basis of your bot, both http/https and socks proxy should working well on the BOT. Hi, I’m considering buying some proxies for my shoe bot but I’d like to know is there any difference between these ‘sneaker proxy’ and normal dedicated one? Both proxies are the private HTTP proxies, no different on technical.. The ‘sneaker proxy’ is the proxy that provider promise to works well on the special sneaker website such as Adidas, FinishLine,Eastbay, Barneys, Sneakersnstuff…and more. Different is that sneaker proxies are checked on the footsite site before you buy, dedicated proxies don’t checked,so the proxies may be already banned by the sneaker websites. try bot-supreme.com for me it’s the another supreme bot. French and English support great team really. Hey, thanks for info. thinking about getting the 20 proxies for 65. How many should I use per task for tomorrow’s Box logo drop? I suggest assign 1 proxy per task, for the proxies are banned easily on supreme. Both the supreme and adidas are strict on it. For foot sites proxy-n-vpn only sell only entire subnets and look like they are tired on the footsite proxies. The supreme usually ban full prefix of datacentre’s IP address AND some of proxy service not have too many proxies on hands, For guarantee other users proxies work, the proxy providers such as sslprivateproxy and proxy-n-vpn only provide only provide 250 proxies package that’s from same prefix(subnet). Thanks for the article John, that’s really helpful. Can you advise me on something please… if i’m based in the UK what location is best for my proxy? I want to access Supreme as fast as possible. sorry, i thinks you should test by yourself for i really no experience on it. 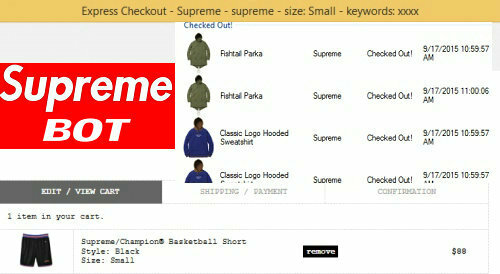 then install the supreme bot on your server,and step the usa proxies on you BOT. after connect to the VPN, you’re just like based in the US. Sorry, i only use the proxies located in US. i suggest you sent a ticket to the proxy service to know more detail about the location of Europe proxies. BTW, Usually proxy providers offer ip address of datacenter servers that’s mainly from Netherlands, Germany,United Kingdom. Try atcproxys.com. Been very successful and they are actually reliable and not banned on the drop. You can share you proxies when Supreme / Adidas / Footsite sneaker or shoes websites dropping. And i don’t use the proxies, if you’ve used actproxys please share your review here! I purchased Supreme bot these days,but I am afraid that I get IP banned from Supreme website. I want to buy multiple items, so if I buy private proxys, can I get my hope? And please also advise how to set the proxy on Supreme bot after buying your proxy. You need carefully use the proxies, it’s easy to ban the proxies on Supreme and the proxy service not offer money back to this type of proxies.